Tankless water heaters buying tips, review of the best models, advanced features, advantages, disadvantages, types and popular manufacturers. See how to select the right size, model and check out the tips to save, install and maintain properly. Also called on-demand water heaters, tankless devices are using an innovative tank-less technology to provide hot water on demand, when needed and in endless supply, resulting in fast hot water delivery, energy savings and enhanced comfort and convenience. Tankless water heaters have many advantages over standard storage tank-type models. On-demand heating. Tankless heaters heat the water on demand while conventional tank type heats water even when it is not needed (or used); for example, during the night, when away from home or when on vacation. Therefore, during tankless heating, hot water is always clean and fresh and no more fighting the rust and scale buildup inside the tank, resulting in less time spent for maintenance. Endless supply. Tankless hot water heaters provide an endless supply of hot water with the continuous flow while keeping the energy consumption and greenhouse gases low. There is no shortage of hot water, which is very important if you have a large family, small kids, visitors or planning to fill up a hot tub. While many people call the tankless – instantaneous, they do not provide instant hot water. If you want hot water delivered fast, look for the tankless model with the recirculation system installed, either with the internal or external mode. Versatile. Tankless gas water heaters are versatile units; they can be used indoor or outdoor, and due to its compact and small size, they are usually mounted on the wall without occupying the valuable floor space. They mostly use direct and power vent system for an efficient and safe removal of flue gases. Save energy. These on-demand heaters are able almost completely to eliminate the standby heat loss while reducing the energy consumption by up to 30% (some manufacturers claim savings even more). As the water is heated and used at the same time (not water storage) most of the tankless water heaters are high efficiency and Energy Star compliant. Quality elements. 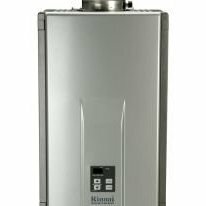 Most of the modern tankless water heaters such as Noritz, Rinnai or Navien are using quality elements found in their advanced models and for both residential and commercial water heating. This includes commercial grade elements and sophisticated electronically-controlled processes with the self-diagnostic programs for easy troubleshooting. Most of the components can be replaced (while in the tank-type not), so if one element fails you can replace it, which makes the heaters long lasting - they can last up to 20 years. There are some comments that tankless water heaters cannot meet the requirements for higher hot water demand and that they are built for point-of-use applications only. That is not true, and I disagree with these comments, as many models can deliver hot water to more than two fixtures, Noritz NRC1111, for example, can deliver up to 11 GPM water flow. These advanced models can even use the multi-system connection feature which connects two or more units to work as one system, providing more power and water flow. Small. Small size and flexible installation are what allows tankless water heaters installation virtually anywhere, but mostly on the wall. Keep in mind that proper location is very important for installation as it should be approachable for cleaning, maintenance and flushing, for example. Common complaints found for tankless hot water heaters are cold-water sandwich effects where some models are not capable of providing the consistent water temperature. Another drawback is if you need a trickle of hot water for shaving or hand washing, a burner might not ignite as the flow switch doesn't react on the low water flow. Of course, this is not present on every single tankless model, but only “value” or economy models. That is why you will often see users complain “no hot water”. Initial costs of the tankless gas water heater, installation, venting, maintenance, and service, are much higher than for conventional hot tanks. They are called "Instantaneous" but they do not deliver hot water instantly as there is still unheated water between the heating unit and the plumbing fixture and which has to be pushed out. Another drawback of the electric models is that they require lots of Amps, so proper panel size should be installed, which is another cost for you. More about tankless vs. tank here. Tankless water heaters can be found as electric - or gas-powered. Tankless gas water heaters are most of the time factory set to use natural gas, and the conversion kit is used to convert them to use propane or LP gas. Both gas and electric tankless models are designed for the whole-house and as the point-of-use units. More BTUs (kW) or water flow rate one unit has, more plumbing fixtures can operate at the same time and deliver hot water at the uniform temperature. Another category of tankless gas water heaters is becoming very popular; gas condensing type. Condensing technology allows these units to achieve extremely high efficiency, up to 96%, so only 4% of energy is wasted. This is possible as the second heat exchanger was added to capture the heat from the exhaust gases and use it to preheat incoming cold water. Another great advantage is the lower temperature of the flue gases resulting in using inexpensive vents such as PVC. Typical examples are Rinnai, Noritz and Navien and its condensing models. Indoor tankless models are mainly combustion sealed so the indoor air is untouched, so they can be installed even in the kitchen or room. Brand. Look for the popular brands when buying as they have a great selection, quality models and large service and distributor’s network. These are Rinnai, Noritz, Rheem, Takagi, Bosch, Navien, and Paloma for the gas type, and Stiebel Eltron, Titan, Eemax, Bosch, Chronomite, and EcoSmart for the electric tankless. Fuel type. Tankless water heaters are using mainly natural gas, propane or electricity to heat the water. If the propane gas is your only option, the outdoor propane gas tank and its supply lines should be also considered. The advantage of electric tankless water heaters is that the electricity is available everywhere. Natural gas is also available to the regions with the greater population. This is for many the best option due to its availability and cost. Size and capacity. Calculate what the peak hour demand for your household is. Based on how many gallons of hot water your home needs, look for the models that meet this requirement with the water flow rate; usually shown in GPM or gallons per minute. Another important factor to consider is the heating power (BTU for gas units and kW for electric). If the size is not properly optimized, you might have only lukewarm water when several plumbing fixtures are in use. Efficiency. It is easy to buy high efficient heaters. Just look for the blue Energy Star logo. Energy efficiency, energy factor or EF are actually showing the ratio of the heating energy delivered as hot water compared to the energy that is used by the heater over a one-day period. Energy Star approved models meet the strict energy efficiency guidelines set by the Government Energy Departments. Venting options. Electric tankless models do not require venting, while gas-type do. Most of the tankless use either direct or power vent system for indoor models, while the outdoor units are ventless. Price and warranty. The prices for tankless water heaters are going from below $500 to over $1500, for the best condensing models. Most of the manufacturers provide a 12-year warranty on the heat exchanger and 5-years on other parts, while the best one found is 15-years. Other factors that are important to know, include the temperature of the incoming water, water flow rates measured in gallons per minute (GPM) and the temperature rise. For the home where the shower, dishwasher, and washer applications are used at the same time, the total water flow is 5.5 GPM (2+1.5+2). If the temperature of the incoming water is 60 F and desired temperature of the outgoing water is 120 F, then look for the model that is capable of raising the temperature of water 60 F at 5.5 GPM. Use this pdf from Bosch to determine the groundwater temperature in your area (US). It is good to know that gas tankless water heaters are able to produce a larger temperature rise than electric models. Tankless water heaters are the great option for homeowners. If you are looking for an on-demand heater with the low or high water demand look for Rinnai, Takagi, Bosch or any other. Tankless does require a large up-front investment, but you can take advantage when buying the Energy Star model which pays off in the long run. Tankless water heaters reduce the energy consumption by at least 30% and heat the water only when you needed it, so water is always fresh (vs. storage tanks where it is sitting for hours or days). Proper sizing will bring you enough hot water, and you will never run out even during the heavy usage.